A Monarch butterfly with a WSU tracking tag on its wing. Sixty of these butterflies were found in the wild. This one in Avila Beach, Calif., located between Los Angeles and San Francisco. 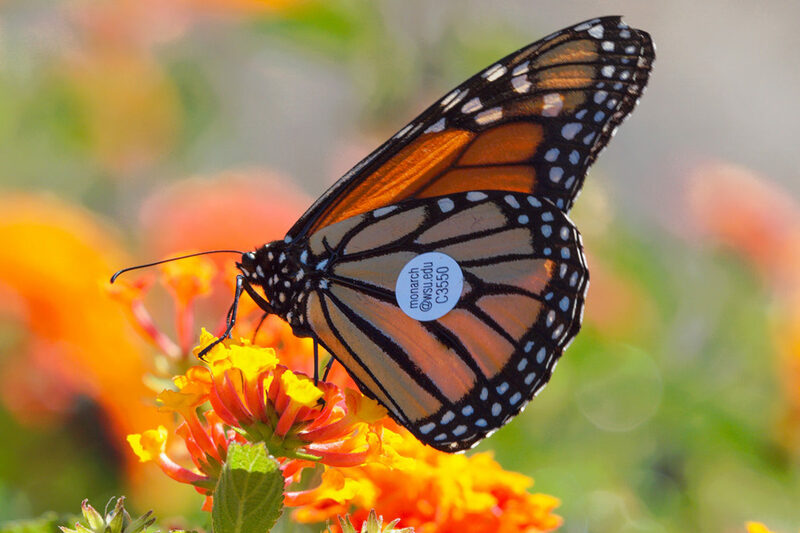 PROSSER, Wash. – After five years and nearly 15,000 tagged butterflies, scientists now have proof that Monarch butterflies migrate from the Pacific Northwest to California in late summer and fall, a journey averaging nearly 500 miles. The findings were recently published in the Journal of the Lepidopterists’ Society. WSU entomology professor David James spearheaded the project, which took a massive amount of time and coordination to put together, ultimately involving hundreds of volunteers. The research was unfunded, making the volunteers indispensable. Though scientists don’t know exactly how the butterflies travel that far, they suspect the Monarchs may ride warm air currents called thermals a few thousand feet up in the air, then use the strong upper-air currents to navigate, James said. 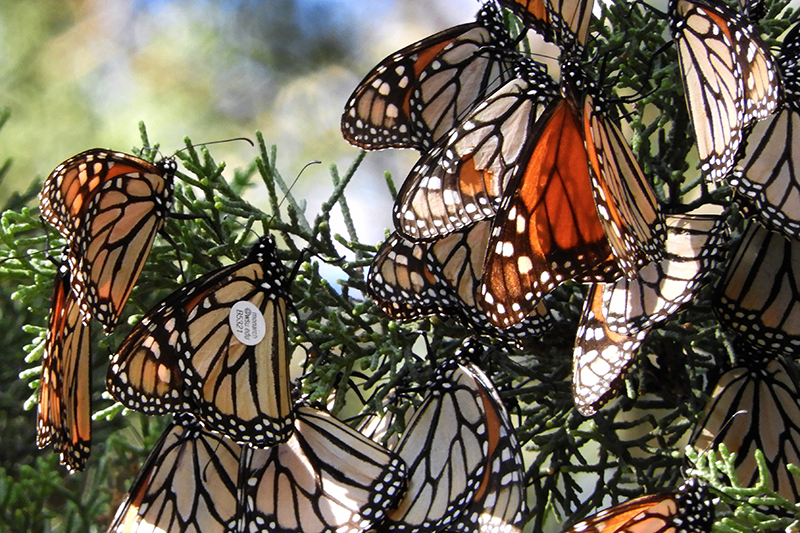 A cluster of Monarch butterflies seen in the wild — one with a WSU tag on it. Monarchs have seen a huge population decline over the last two decades, James said. It’s estimated populations have declined approximately 90 percent over that timeframe. Ensuring nectar resources along migration routes will help them survive their journeys. James said he’s never worked on a project with so many citizen scientists before, and is incredibly grateful for all of their help. “The results we got would have been impossible without their help, whether that’s the prisoners or just people that care about butterflies who have contacted us,” James said. The project is still ongoing, with nearly 5,000 people on the group’s Facebook page. Read the Journal of the Lepidopterists’ Society article.